What a delightful name this little griddle cake has. The origins of the traditional scone-like griddle cake called a Singin’ Hinny is easily identified. Hinney is the pronunciation of " honey " in the north east of England around Sunderland, Newcastle and through to Northumberland. It is a term of endearment used usually to and about women and children.With the singing part of the name from when the cakes are cooked in a hot flat griddle pan, as they hit the pan, the butter and lard starts to sizzle and ‘sing’. Delightful all round. The hinny mixture resembles a scone mixture, and, as with scones, need handling the same way so the mixture does not becomes tough. These may be griddled cakes, but should still be light and crumbly. You can see how to keep them light in the notes at the end of the recipe. 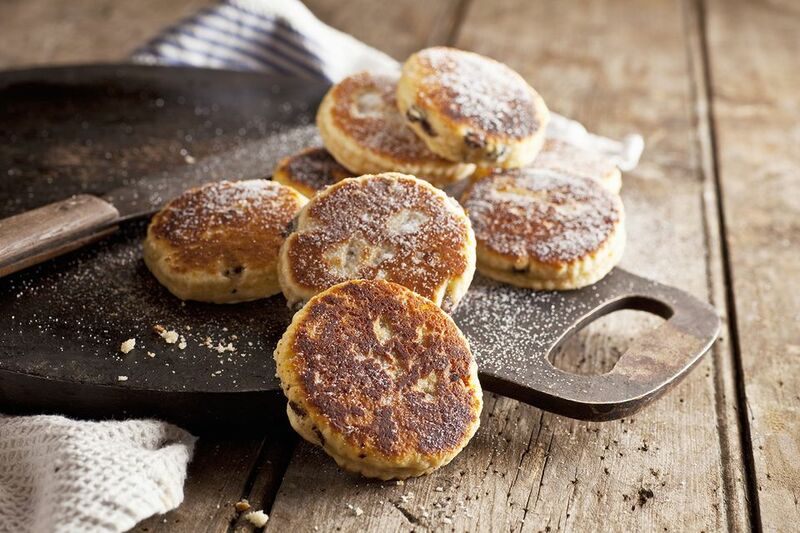 These northern griddle cakes are not dissimilar to a Welsh Cake , but without any added sugar. Sweetness in the hinnies comes from the dried fruit. Into a large roomy baking bowl, sieve the flour, bicarbonate of soda, cream of tartar and salt. Cut the cold butter and lard into small pieces, add to the baking bowl and rub together with the flour until it resembles rough sand. Stir in the lemon zest and the mixed fruit. Once thoroughly mixed gradually add milk, a little at a time, until the dough comes together and is soft and pliable. Dust a board or work surface with a little flour, and roll out the dough to around 5mm (the depth of a £1 coin) using a 6cm / 2” cutter. Heat a flat griddle pan or a heavy-bottomed frying pan. Using a little kitchen paper smeared with lard, grease the pan lightly. Once hot, cook the hinnies, a few at a time for approx 5 mins on each side or until golden brown. Serve warm with a good smearing of butter, or simply sprinkle with a little sugar. The hinnies are best eaten fresh but can be stored in an airtight tin for 24 hours. Make sure the equipment and ingredients used for making the hinnies are all as cool as possible, including your hands. The butter should be very cold - but not frozen. Warm hands, ingredients, and equipment if too warm will melt the butter rather than it be rubbed in resulting in dense scones. Work quickly, and lightly. Avoid over rubbing or kneading the mixture; it does not need to be super-smooth, simply needs to be pulled together in a light, pliable dough. When cutting the hinnies using a tart cutter, avoid twisting the cutter, just press down then gently shake the hinny onto the prepared tray. If cutting with a knife, make sure it is sharp blunt knives or twisting the tart cutter tears at the edges of the hinny and stops any rise when cooking.